Both pond sliders and koi make interesting additions to the backyard pond. While each species has their own nutrition requirements, they have considerable overlap and neither the turtles nor the fish have particularly complicated diets. With a little attention to detail and some seasonal preparations, you can feed both species in the same pond. Koi are unfussy, a trait their share with their goldfish relatives. You can feed a commercially available koi food, such as pellets as a staple or main food item. Make sure you purchase pellets designed for koi or goldfish, since they have somewhat different nutritional requirements than tropical fish. The packaging will make it clear if a food is intended for koi or tropical fish. In addition to the staple, feed your koi "treats" at least once a week. A treat can consist of lettuce, earthworms or ghost shrimp. Feeding occasional treats ensures your koi get all of the nutrition they need and improves digestion. Feed the koi at least once a day, and only feed what they can eat in less than five minutes. Pond sliders eat a variety of meat and vegetables, and a varied diet is the key to keeping them healthy. 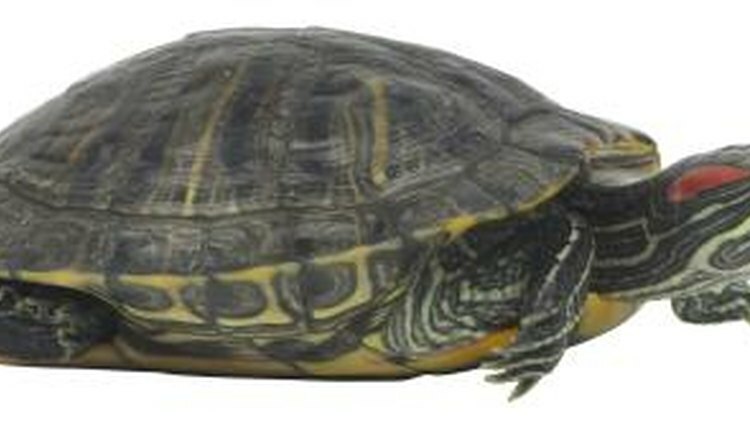 Pet shops do feed dry, prepared foods for turtles, but variety is more critical to turtles than koi, so don't feed commercial turtle food as a staple. Ideally, you will alternate day to day between a vegetable food and a meaty food. For vegetable foods, feed lettuce, aquatic plants like Elodea and spinach. On meat days, feed live crickets, earthworm and ghost shrimp. Feed them at least once per day. Koi and pond turtles' diets have considerable overlap. It is not the end of the world if they eat each others' food, as long as both the koi and the turtles get their share. Some pond keepers feed their turtles out of small plastic dishes. Turtles will rapidly learn to associate the dishes with food. This allows you to have a little more control over your turtles' diet. For either species, do not allow excess food to sit in the pond, since it will rot and foul the water. The big difference in the pond care of slider turtles and koi comes in the wintertime. Most pond sliders come from warmer tropical and subtropical regions. This means you need to take them inside for the winter once the water temperatures start dipping below 70 degrees Fahrenheit. Koi better resist the cold, and can hibernate over the winter. However, you need to take special steps to protect the koi from the cold. In the warmer months, feed your koi food with 36 percent protein. When the weather begins to cool -- around the time you take your turtles inside, switch to a staple food with a protein content of 25 percent. The label of a staple food will list the protein content. Once the temperatures fall below the mid-50s, stop feeding all together, since koi cannot reliably digest food below this temperature. What Happens When You Overfeed Goldfish? What Live Food Will Koi Eat?